I’m at W. Kerr Scott Reservoir in North Wilkesboro with 10 other women from their mid-20s to 60s who are participating in the Becoming an Outdoors Woman (BOW) program. According to the title, which, let’s be honest, sounds a like a reality television show, we’re here to learn wilderness skills. But as we’re gathered under a picnic shelter, taking turns introducing ourselves and revealing why we signed up, already the collective honesty makes this event worthwhile. I’m no Katniss Everdeen, ready to square off against other Hunger Games contenders, but I’m not quite a supermarket girl either. I think of myself as an urban outdoors type: I enjoy a day-hike as long as someone else navigates. And while I consider it important to know where my food comes from, you’ll find me in a vegetable garden before a hunter’s tree stand. Christine Thomas, former dean of the College of Natural Resources at the University of Wisconsin-Stevens Point, dreamt up BOW in 1991 as a nonprofit program to teach women skills such as hunting, fishing, and orienteering. It’s now an international network with chapters in dozens of states, including this one, which runs its program through the N.C. Wildlife Resources Commission under the adept and passionate leadership of coordinator B.B. Gillen. Gillen organizes events across the state, including two intensive weekends, as well as several slower-paced sessions, like this one taught by skilled volunteers. This weekend, we’ll split into two groups and try our hands at basic archery, native plant and animal identification, and fishing. 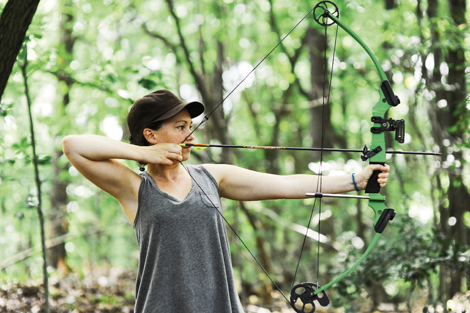 My crew begins with archery, a sport that our male instructors say has gained popularity among women since the Hunger Games film came out last year. During the lesson, I imagine channeling the main character, Katniss Everdeen, and miss the bit on how to use the peep sight. When my turn comes, I’m mystified as to which of the tiny holes on the bow is supposed to help me aim. Luckily, the instructors display infinite patience, even as my arrows repeatedly soar at least two feet above the giant bull’s-eye. For our archery finale, we tromp into the woods to test our aim on the 3-D foam animals sneakily placed among the trees. At this point, we’re all friends, swapping stories about other outdoor experiences, or the lack thereof. So far, each arrow I’ve shot has flown into the forest and I’ve had to dig around in the leaf litter to extricate it. On our last stop, I take a deep breath, plant my feet wide and stare down the foam hog, suddenly understanding how the sight works. Success! I nail it in a hind leg, and as the lodged arrow quivers, my teammates cheer and clap. I feel a surge of adrenaline that I’m not accustomed to. Day two begins with a stream hike. Our guide, C.C. King, picks out trees and flowers along the trail and invites us to find their names in plant identification books. Then she says something that resonates more than the scientific descriptions: “Names aren’t important; it’s how we relate to life out here, how we notice it. What story is it carving in the environment?” she asks as she points to animal tracks along the riverbank. Most of us take our shoes off to wander through the stream for our next assignment: to find and identify tiny invertebrates. King teaches us to gently lift submerged rocks to discover life clinging to the undersides. We put each find in a clear petri dish and marvel at water-penny beetles and caddis flies, and even those insects we can’t name. The air has been thick with the promise of rain for a while now, so when the sky opens up we head back early, soaked by the time we’ve run down the trail to the cars. The skies clear in time for our last session, and we take a short drive to W. Kerr Scott Lake to learn how to tempt, catch, and release fish. After the demonstration, I cast and recast my line from the dock with no results. Kim Marcom offers to help and leads me to a spot where we wade knee-deep into the lake. As I bait my hook, she tolerates my squirming with laughter; the worm and I clearly just want to get away from each other. Marcom shows me how to firmly bait the hook and cast my rod in the water near a knot of plants arching over the bank. I’m nervously waiting for a nibble, my bare toes curled around pebbles for traction, when a tug on the line startles me. I lose my footing in the slippery clay and bruise my bottom, but there’s a catch waiting to be reeled in, and Marcom demonstrates how to cup the wriggling fish so I can free the hook. After admiring the transparent fins and scales that reflect the afternoon light, I toss him back. Considering my struggle handling the worm, never mind the live fish, I don’t think I’ll be hunting animals any time soon, but maybe next time I’ll hit the bull’s-eye.